Ladner B.C.’s James Paxton is the first Canadian to throw a no-hitter on home turf, but the man they call Big Maple refuses to chuck his Canuck identity. Canadian players are no longer a rarity in the big leagues. But some, once they get caught up in “America’s Pastime,” tend to downplay their Canadian heritage. (Hello there, Joey Votto.) Not James Paxton. He has remained true to his hometown roots in bucolic Ladner. “Games in Toronto are the only ones they see us play, so it’s awesome that it was on TV in Ladner,” he told a post-game interviewer. “He was in the same bewildered state as the rest of us,” said Pops Paxton, who reminded Elliott that last week’s gem against the Jays was not his son’s first no-hitter. He tossed one against Ridge Meadows when he was 12 and still has the baseball at his home in Seattle. Canada has been a tad late to embrace the James Paxton story, perhaps because he plays for Seattle out on the west coast, far from the home of the Jays and the self-proclaimed “centre of the Canadian baseball universe.” Also diminishing his profile has been a frustrating series of injuries that have put him on the disabled list year after year. Until last year’s dozen victories, he had never managed more than six wins or better than 121 innings in a season. So the height of his pre-no-hitter fame may have been early this April, when a befuddled bald eagle lit down on Paxton’s right shoulder during the American national anthem. Video of the bizarre incident and the pitcher’s remarkable sangfroid were a huge hit on YouTube. Some have suggested the eagle may have been channeling the spirit of his grandfather Lawrie, who died the morning of his grandson’s first major league start. 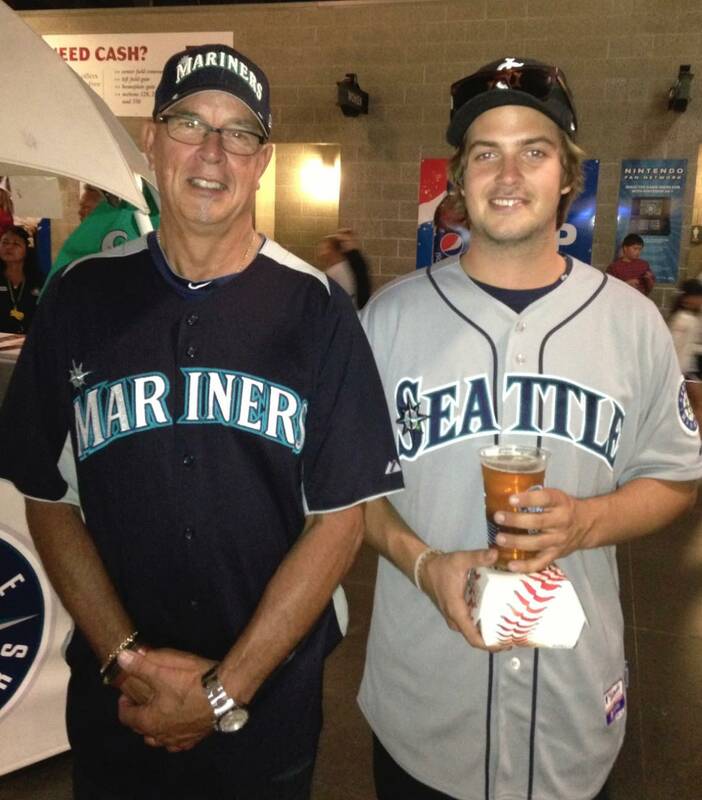 Bringing Their Eh-Game: James Paxton’s uncle and brother in Seattle. For more Mickleburgh, please visit the Ex-Press archives or check out Mickleblog.com. No Replies to "A Great Big Yes to James Paxton’s No-No in Toronto"